Maybe you’ve heard of the phenomenon. Did you know that Meatless Mondays were initially a war rationing campaign? During World War I the government encouraged Americans to consume less meat and wheat to be able to send more staples to our troops and our allies. It has since been revived as a public health campaign to improve health and minimize the negative impact on the planet. Going meatless once a week may reduce your risk of chronic preventable conditions like cancer, cardiovascular disease, diabetes and obesity. It can also help reduce your carbon footprint and save precious resources like fresh water and fossil fuel. And it’s NOT about converting everyone to vegetarianism! To join the movement, I pledge to not only not eat meat on Mondays, but I will post a delicious meat-free recipe every Monday. This first installment is a quick side dish that goes great with a veggie burger, grilled cheese sandwich, or in my case, a little fried potato with onions, and a slice of homemade bread. Nom! So if you somehow haven’t tried kale chips yet, get yourself ready, cause I have made these things a million times and narrowed it down to the easiest way possible to bake the best chips. I hadn’t made them in awhile, but we got kale in the CSA share right after hurricane Sandy, and so I was inspired. 1. Preheat the oven to 400°. Wash the kale thoroughly. Check for little brown bugs. 2. Remove the stems from the leaves. They don’t bake up very well and taste a little bitter, so we don’t eat them. Dry the leaves with some paper towel or a regular tea towel. Tear the leaves into potato-chip sized pieces. 3. 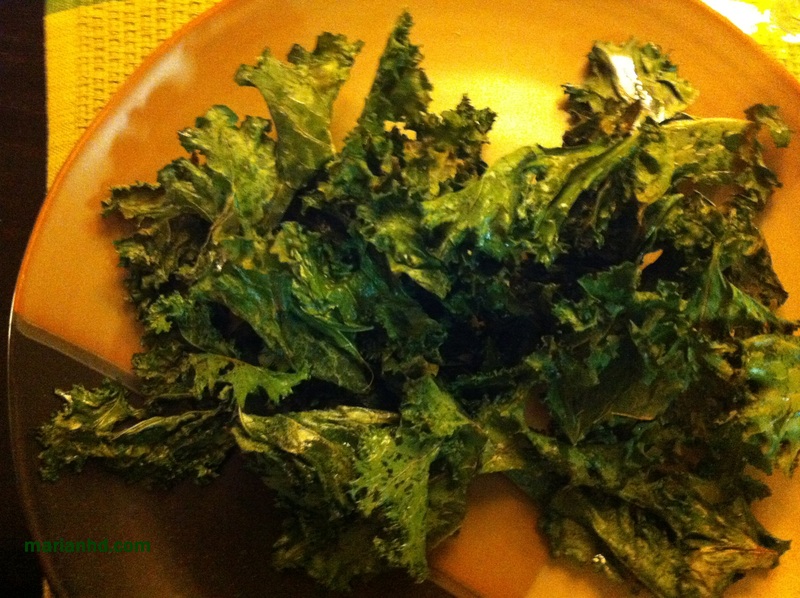 Toss the kale in a bowl with olive oil. Start with just a little, about a teaspoon, and massage the oil into the kale. That’s right. You are giving the kale a spa treatment. Make sure all of the kale ends up shiny and bright green from the oil. Add more if you need to. 4. Spread the oiled kale onto a cookie sheet. Sprinkle the future chips with garlic salt, salt and pepper, and any other spices you think sound interesting. 5. Bake in the preheated oven for 10 minutes or until they become crunchy but not burnt. It’s a fine line, so keep a close eye on it after 8 minutes. If you aren’t sure if they are done, test one and see if it crunches like a chip. They might be so good that you could eat an entire cookie sheet worth of them by yourself. Just maybe. Happy Meatless Monday! And enjoy Election Tuesday by voting! Next Post Next post: Today is an important day–it’s my birthday! It has been a while since I made a batch of these. Looking forward to throwing some in the oven with my next bunch of kale.